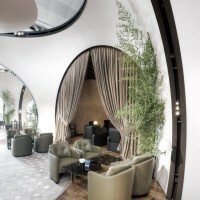 Autoban have designed the Turkish Airlines CIP Lounge in Istanbul, Turkey. 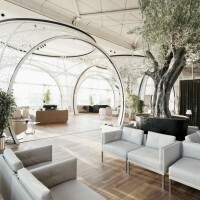 Turkey’s national airline, Turkish Airlines’ new CIP lounge has been opened at the Ataturk Airport International Departures in Istanbul. 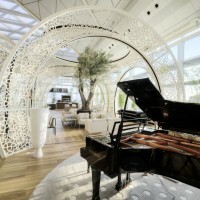 Designed by Autoban’s architectural standpoint, the lounge is spread over 3000m2, with a daily capacity of 2000 people. 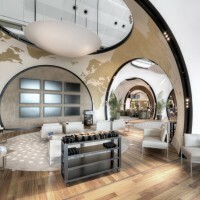 Taking into account the primary purpose of the space – to transmit the “Contemporary Turkey Experience” to Turkish Airlines passengers – the design concept is based on the idea of a second shell within the existing shell of the airport hall. The main structure, established by making use of the traditional architectural arcade system, consists of a combination of global forms. 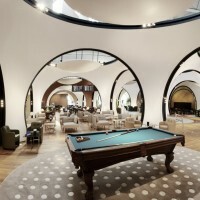 These plain spheres create interior combinations by dividing the place into sections, allowing transitions between them. 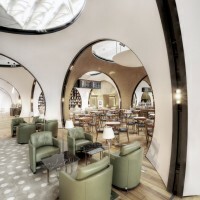 CIP Lounge’s each module undertakes a different function. 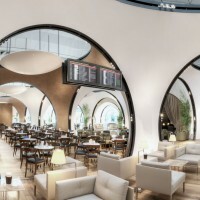 Services like resting rooms, restaurant, tea garden, library, movie theater and so on provide passengers a chance to experience each and every different interior separately. 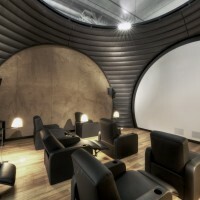 Spatial organization, which gives the sense of discovering while moving through the lounge; is the natural outcome of the desired architectural layer, which places the mentioned “experience” forward. Black channels, located in the merging points of modules, are designed to allow mechanical and electrical systems. These channels are among the vital details that bring visual balance to modules which are produced in accordance with the understanding of industrial design. Visit the Autoban website – here.